Went 15-8 with a 3.50 ERA in a career-high 35 starts during his first season with Milwaukee... Was named Brewers Unsung Hero as voted on by members of the Milwaukee Chapter of the Baseball Writers Association of America... His 35 starts led the Major Leagues.....made 30+ starts for the fourth time in his career... Also posted career highs in wins (15 - T6th in NL) and strikeouts (156)... The team went 23-12 in his starts... Produced a team-leading 12 quality starts, going 8-2 with a 1.53 ERA in those starts (76.2ip, 13er)... Held opponents to a .220 batting average, which ranked seventh in the National League... Recorded a career-high 6-game winning streak over 11 starts from 4/20-6/13 while posting a 2.69 ERA (63.2ip, 19er).....the team went 10-1 in his starts during this stretch... Had a season-high 10 strikeouts over 7.0 innings in a 7-0 win on 8/14 at Chicago-NL.....was the third double-digit strikeout game of his career... Earned Brewers Pitcher of the Month for July (5gs, 4-0, 2.64era) and August (6gs, 4-2, 3.79era)... Started the NL Central tie-breaker game on 10/1 at Chicago and allowed just 1 run on 1 hit (Anthony Rizzo HR) in 5.2 innings (2bb, 3k) and received no decision in the Brewers' 3-1 victory... Made 3 postseason starts, going 2-1 with a 1.46 ERA... Earned a 4-0 win in Game 2 of the NLDS vs. Colorado (5ip, 3h, 3bb, 3k)... Earned a 4-0 win in Game 3 of the NLCS at Los Angeles (5.1ip, 3h, 2bb-1ibb, 6k)... Took a 5-1 loss in Game 7 of the NLCS vs. Los Angeles (2ip, 3h, 2r, 2er, 1bb, 0k, 1hr). Jhoulys Chacin (pronunciation: JO-lease sha-SEEN) split the 2016 season between the Atlanta Braves and Los Angeles Angels of Anaheim, pitching to a combined 6-8 record with a 4.81 ERA (77 ER, 144.0 IP) and 119 strikeouts against 55 walks in 34 appearances, 22 starts. Began the season with Triple-A Gwinnett before having his contract selected by Atlanta on 4/12. Made five starts for the Braves, going 1-2 with a 5.40 ERA (16 ER, 26.2 IP) while striking out 27 and walking eight before being traded to LAA on 5/11 in exchange for LHP Adam McCreery. In his one start for Gwinnett on 4/7, earned the win and tossed 7.2 scoreless innings, allowing five hits and two walks while striking out seven at Norfolk. Went on to appear in 29 games and make 17 starts for the Angels, posting a 5-6 record with a 4.68 ERA (61 ER, 117.1 IP) and 92 strikeouts against 47 walks. Tossed a career-high tying 9.0 innings on 5/30 vs. DET, earning the win and striking out 10 while allowing one run on four hits and one walk in the club's 5-1 victory. Over his final four starts of the season, went 1-0 with a 0.75 ERA (2 ER, 24.0 IP) and 20 strikeouts against five walks while limiting opposing hitters to a .198 (17-for-86) average. In his 11th professional campaign, split the season between the Arizona Diamondbacks, Triple-A Reno and Triple-A Columbus, pitching to a combined 9-7 record and a 3.24 ERA. Attended Major League spring training with the Colorado Rockies and was given his unconditional release on 3/25. Signed by the Cleveland Indians to a minor league contract on 4/14. Made his first appearance of the season with Triple-A Columbus on 514 Released by CLE on 6/18 and signed as a minor league free agent by the ARI on 6/20. Had his contract purchased and made his ARI debut on 8/24...posted a 2-1 record with a 3.38 ERA in five appearances, four starts, for the Diamondbacks. Made two starts for ARI, 8/24 vs. STL and 8/29 at OAK, prior to being optioned back to Reno on 8/29. Recalled by ARI for the final time on 9/8 and made three appearances, two starts, the remainder of the season. Posted a 3.22 ERA while going 7-6 in 20 minor league starts between Triple-A Columbus and Triple-A Reno. Lasted at least 6.0 innings in 14 of his 20 minor league starts, 11 of which were 7.0-plus inning efforts. On 9/27 at SD, made his first appearance out of the bullpen since 7/23/10 at PHI. 2014: An injury plagued season resulted in him making just 11 starts at the Major League level, posting a 1-7 record with a 5.40 ERA (38 ER, 63.1 IP) and 42 strikeouts against 28 walks. Began the season on the 15-day DL with a right shoulder strain before being reinstated on 5/4...placed on DL again on 6/30 with right shoulder inflammation and would spend the remainder of the season on the DL. His 11 starts and 63.1 innings pitched were his lowest in any of his five full Major League seasons (since 2010). Made his season debut on 5/4 vs. NYM...went 5.0 innings and allowed four runs as the Rockies lost 5-1. His first quality start of the season came in his next outing on 5/9 at CIN as he allowed two runs on four hits over 6.0 innings. Did not allow more than four runs in each of his first seven starts but the Rockies scored 10 combined runs of support in those starts (2.33 RSA). His first and only win of 2014 came on 6/12 vs. ATL as the Rockies won 10-3 and he went 7.0 innings of shutout, two-hit baseball. Took the loss in his next three starts before being placed on the 15-day DL on 6/30...transferred to the 60-day DL on 7/4 through the end of the season. On 6/12 vs. ATL, he became the seventh pitcher in franchise history to hit the 500 strikeout mark in a Rockies uniform, joining Ubaldo Jimenez, Pedro Astacio, Jeff Francis, Jorge De La Rosa, Jason Jennings and Aaron Cook. He was the 141st active pitcher to join the 500 strikeout society. With his start on 5/9 at CIN, he made his 100th career start, all with the Rockies. He became the ninth Rockie to have ever started at least 100 games and 95th active pitcher with at least 100 starts. Jhoulys set career highs in wins (14) and innings pitched (197.1) while starting a career-high-tying 31 games for the Rockies...he was 14-10 with a 3.47 ERA (197.1 ip, 76 er) with 19 quality starts... Was placed on the disabled list on 4/20 with a left lower back strain and was reinstated on 5/5...his 31 starts were tied with teammate Juan Nicasio for most starts while his 126 strikeouts led the team... Chacin became the third-youngest Rockie pitcher to open the season as the team's Opening Day starter at the age of 25 years and 84 days old...David Nied in 1993 (24 years, 104 days) and Jason Jennings in 2003 (24 years, 258 days) are the only other younger Opening Day starters over the franchise's 21 Opening Day's...the 25-year old didn't disappoint going 6.2 innings and allowing one run on three hits with six strikeouts in the no-decision... Forced opponents to ground into 30 double plays this year...that's the second-most by a NL pitcher, trailing only Adam Wainwright (32)...20 of those came at Coors Field which led all pitchers for GDPs at home... In the first half of the 2013 season, Jhoulys established a career-best 5-game winning streak (6/11-7/4)...during the streak that spanned 5 games, he tossed 34.1 combined innings and allowed just 8 runs (2.10 ERA) and allowed 30 hits...he became the second Rockies pitcher this year to have a 5-game winning streak (De La Rosa, 5/7-6/2)... Chacin set a new record for the longest a pitcher has taken a no-hitter in a game on 8/28 vs. SF at Coors Field (previous 6.1 no-hit ip by John Thomson 5/2/02 vs. PIT)...Chacin took a no-hitter into the 7th inning, before Brandon Crawford broke up the no-hit bid with a 2-out single...he also matched Jorge De La Rosa on 5/12 at STL for the longest a Rockies pitcher has taken a no-hitter this season. 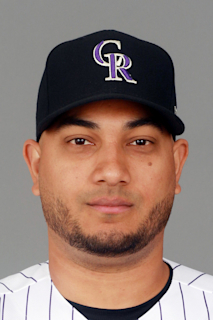 Jhoulys Chacin made 14 starts in his fourth season with Colorado...the right-hander has now made 82 career appearances, 67 starts, all in Purple Pinstripes, before his 25th birthday. Chacin began the season allowing 20 runs over 24.2 innings in five starts before being placed on the disabled list withright shoulder inflammation...Chacin returned from the DL 8/21 vs. LAD after spending 97 games on the disabled listdue to right shoulder inflammation...in his final nine starts after his return from the DL, Chacin went 3-2 with a 2.84 ERA(44.1 ip, 14 er), tossing at least 5.0 innings in six of those starts. Chacin's ERA: Chacin currently has a 3.68 ERA in his 82 appearances, 67 starts, over parts of four seasons with theRockies...that mark is the second-lowest among any Rockies starter in the history of the franchise (min. 100.0 ip)...he sits behind only Ublado Jimenez's 3.66. Chacin has quality starts in 32 of his 67 career starts and has tossed at least 6.0 innings in 37 of his 66 career starts. Opponents hit .288 (80-for-278) against him in 2012, the highest mark against him in his career (.227 in 2010, .231 in2011)...left-handers batted .293 (43-for-147) while right-handers hi .282 (37-for-131) in 2012. On his way back from the DL, Chacin made five starts at three different levels of the Rockies system...one start at HighA Modesto and two at both Double-A Tulsa and Triple-A Colorado Springs...between the three stops he went 1-3 with a 5.40 ERA (25.0 ip, 15 er), seven walks and 13 strikeouts. Chacin is one of 18 pitchers who have thrown at least 200.0 innings at Coors Field over the stadium's 19-year history...in his career he has a 4.18 ERA at Coors Field, the third-lowest among the 18 pitchers behind only Jimenez (3.67)and reliever Fuentes (3.48). Chacin has pitched in 38 career games, 32 starts, against NL West teams...he is 14-12 with a 3.21 ERA (196.0 ip, 70er) and 161 strikeouts in his career vs. NL West opponents. Among National League rookies, Chacin finished second with 138 strikeouts, third with an opponent battingaverage of .237, tied third with nine wins and fourth with 21 starts, an ERA of 3.28 and 137.1 inningspitched...Set the Rockies rookie record for most strikeouts in a rookie season with 138 and having the lowest ERA(3.28) by a Rockies starter in his rookie season...From 8/17 through the end of the season, he went 4-2 with a 1.44 ERA (50. 0 ip, 8 er)...opponents hitjust .217 (39-for-180) over those eight starts including just eight extra-base hits and 18 walks comparedto 45 strikeouts...Over his 21 starts, the Rockies averaged 4.62 runs of support...in his 10 losses as a starter the Rockiesgave him just 17 runs of support while in his nine wins they supported him with 42 runs...among rookieswith at least 10 starts in 2010, his 4.62 run support average ranked 15th in the Majors...Became the seventh Rockies rookie pitcher to toss at least 7.0 shutout innings in a start in franchise history,doing it in back-to-back starts 5/2 and 5/8...also tallied 7.2 shutout innings 8/22 at ARI...he tossedhis fourth 7.0-plus inning shutout outing 9/18 at LAD, tying a team record for 7.0-plus inning shutout outingsin a rookie season...the feat has been accomplished 14 times, as Jason Jennings (four times) andJohn Thomson (twice) both did it multiple times as rookies...he is the first Rockie rookie to toss 7.0shutout innings in a start since Denny Stark also did so 9/24/02 at LAD...became the third Rockie rookieto allow just one hit in his 7.0 inning shutout performance, as both Jennings (8/1/02 at PIT) and Stark(9/24/02 at LAD) surrendered just one hit while tossing 7.0 innings...his nine strikeouts in his 7.1 inningshutout 5/8 at LAD were the most strikeouts in a 7.0-plus innings shutout in Rockies history. Began the season with the Tulsa Drillersin the Texas League as the club's ace...called up toColorado for his MLB debut in late July...later madefour starts for Colorado Springs in August beforereturning to the big leagues for the stretch run inSeptember...allowed just 4 runs in his first threestarts for the Drillers to open the season...thenallowed 9 runs, 7 earned in 4.2 innings during a starton 4/26 at Springfield...following that start, went 7-3with a 2.71 ERA (83.0 ip, 25 er) in his final 14 starts for the Drillers before being summoned to the Majorson 7/24; made MLB debut the next night on 7/25 vs. SF, tossing a scoreless inning with a walk and 2 strikeoutsin the Rockies 8-2 victory...went on to make two more scoreless appearances, on 7/28 at NYM and8/4 at PHI...allowed his first run 8/8 vs. CHC, surrendering a solo home run to Kosuke Fukudome in the 7thinning, although he would strike out 4 batters in his 2.0 frames in the contest...made first MLB start 8/11 vs.PIT and took first loss after allowing 4 runs, all earned on 1 hit and 6 walks in 2.2 innings...following thatstart he was optioned to Triple-A Colorado Springs...made his Triple-A debut 8/18 at Oklahoma City, pitchingthe first 5.1 frames of a combined no-hitter for the Sky Sox...made three more starts for the Sky Sox,including 4.0 scoreless frames in his final outing on 9/3 vs. Portland...returned to the Majors on 9/8 andmade 3 appearances for the Rox in the final month of the season...Major Leaguers hit just .167 (6-for-36)against him, and he had a 10.9 so/9.0 ip ratio in the Majors, though he walked 11 batters in 11.0 innings aswell...following the Minor League season, was named to the Texas League Post-Season All-Star team...wasalso named the Rockies 4th best prospect by Baseball America following the season. In his first full professional season, Chacin was named the MiLB.com Minor League StartingPitcher of the Year...was also named by Baseball America as a Minor League All-Star and a Class A All-Star...was named a South Atlantic League mid-season and post-season All-Star...was also nominated forthe Minor League Pitcher of the Year award by MILB.com...began the season at Asheville and did not allowa run in his first two starts of the season en route to going 4-1 with a 1.85 ERA (39.0 ip, 8 er) in April andbeing named the Rockies Organizational Pitcher of the Month for April...would go on to post a 10-1 recordand a 1.86 ERA (111.1 ip, 23 er) with 98 strikeouts in 16 starts for Asheville before being transfered toModesto 6/29...with Modesto he went 8-2 with a 2.31 ERA (66.1 ip, 17 er) with 62 strikeouts over 12starts...his 18 combined wins led all of Minor League baseball, while his 177.2 innings pitched were 3rd inthe minors...he also tied Cory Riordan for the organizational lead in strikeouts (160), which ranked as 6thbestin the minors...was named by MILB.com as the Rockies Organizational Pitcher of the Year. Finished season leading Casper in wins (6), strikeouts (77), ERA among starters (3.13), inningspitched (92.0), and games started (16)...he also led the Pioneer League with his 92.0 innings pitched, andfinished tied for the league lead with his 77 strikeouts...was the only Casper player to be named to thePioneer League Post-Season All-Star team. December 21, 2017 Milwaukee Brewers signed free agent RHP Jhoulys Chacin. November 2, 2017 RHP Jhoulys Chacin elected free agency. December 30, 2016 Leones del Caracas traded RHP Jhoulys Chacin to Caribes de Anzoategui. December 20, 2016 San Diego Padres signed free agent RHP Jhoulys Chacin. November 14, 2016 RHP Jhoulys Chacin assigned to Leones del Caracas. November 3, 2016 RHP Jhoulys Chacin elected free agency. May 12, 2016 Los Angeles Angels activated RHP Jhoulys Chacin. May 11, 2016 Atlanta Braves traded RHP Jhoulys Chacin to Los Angeles Angels for LHP Adam McCreery. April 12, 2016 Atlanta Braves selected the contract of RHP Jhoulys Chacin from Gwinnett Braves. January 7, 2016 Atlanta Braves signed free agent RHP Jhoulys Chacin to a minor league contract and invited him to spring training. January 7, 2016 RHP Jhoulys Chacin assigned to Gwinnett Braves. November 9, 2015 RHP Jhoulys Chacin assigned to Leones del Caracas. November 6, 2015 RHP Jhoulys Chacin elected free agency. September 8, 2015 Arizona Diamondbacks recalled RHP Jhoulys Chacin from Reno Aces. August 30, 2015 Arizona Diamondbacks optioned RHP Jhoulys Chacin to Reno Aces. August 24, 2015 Arizona Diamondbacks selected the contract of Jhoulys Chacin from Reno Aces. June 20, 2015 RHP Jhoulys Chacin assigned to Reno Aces. June 19, 2015 Arizona Diamondbacks signed free agent RHP Jhoulys Chacin to a minor league contract. June 18, 2015 Columbus Clippers released RHP Jhoulys Chacin. May 14, 2015 RHP Jhoulys Chacin assigned to Columbus Clippers from Mahoning Valley Scrappers. April 14, 2015 RHP Jhoulys Chacin assigned to Mahoning Valley Scrappers. April 13, 2015 Cleveland Indians signed free agent RHP Jhoulys Chacin to a minor league contract. March 22, 2015 Colorado Rockies released RHP Jhoulys Chacin. November 3, 2014 Colorado Rockies activated RHP Jhoulys Chacin from the 60-day disabled list. July 4, 2014 Colorado Rockies transferred RHP Jhoulys Chacin from the 15-day disabled list to the 60-day disabled list. May 4, 2014 Colorado Rockies activated RHP Jhoulys Chacin from the 15-day disabled list. April 24, 2014 Colorado Rockies sent RHP Jhoulys Chacin on a rehab assignment to Colorado Springs Sky Sox. April 15, 2014 Colorado Rockies sent RHP Jhoulys Chacin on a rehab assignment to Modesto Nuts. August 23, 2013 Colorado Rockies activated RHP Jhoulys Chacin from the bereavement list. August 19, 2013 Colorado Rockies placed RHP Jhoulys Chacin on the bereavement list. May 5, 2013 Colorado Rockies activated RHP Jhoulys Chacin from the 15-day disabled list. April 21, 2013 Colorado Rockies placed RHP Jhoulys Chacin on the 15-day disabled list retroactive to April 20, 2013. Left lower-back strain. October 11, 2012 RHP Jhoulys Chacin assigned to Leones del Caracas. August 21, 2012 Colorado Rockies activated RHP Jhoulys Chacin from the 15-day disabled list. August 11, 2012 sent RHP Jhoulys Chacin on a rehab assignment to Colorado Springs Sky Sox. August 1, 2012 Modesto Nuts sent RHP Jhoulys Chacin on a rehab assignment to Tulsa Drillers. July 29, 2012 Jhoulys Chacin assigned to Modesto Nuts. May 7, 2012 Colorado Rockies placed RHP Jhoulys Chacin on the 15-day disabled list retroactive to May 2, 2012. Right shoulder inflammation. May 6, 2012 Jhoulys Chacin roster status changed by Colorado Springs Sky Sox. October 10, 2011 RHP Jhoulys Chacin assigned to Leones del Caracas. August 17, 2010 Colorado Rockies recalled Jhoulys Chacin from Colorado Springs Sky Sox. July 24, 2010 Colorado Rockies optioned Jhoulys Chacin to Colorado Springs Sky Sox. April 27, 2010 Colorado Rockies recalled Jhoulys Chacin from Colorado Springs Sky Sox. March 23, 2010 Colorado Rockies optioned Jhoulys Chacin to Colorado Springs Sky Sox. October 19, 2009 Jhoulys Chacin roster status changed by Colorado Rockies. October 7, 2009 RHP Jhoulys Chacin assigned to Leones del Caracas. October 6, 2009 Colorado Rockies reassigned RHP Jhoulys Chacin to the minor leagues. September 8, 2009 Colorado Rockies recalled Jhoulys Chacin from Colorado Springs Sky Sox. August 12, 2009 Colorado Rockies optioned Jhoulys Chacin to Colorado Springs Sky Sox. July 24, 2009 Colorado Rockies selected the contract of Jhoulys Chacin from Tulsa Drillers. June 26, 2009 Jhoulys Chacin roster status changed by Tulsa Drillers. June 22, 2009 Tulsa Drillers placed RHP Jhoulys Chacin on the temporarily inactive list.